Tonight Ladybug helped me pack her very special hospital bag. The bag was filled with necessities like diapers, wipes, pj’s, and a cuddly blanket. There was one more item in this bag that is by far the most important – it is a very special little bear known in our house as Pembe Bear. 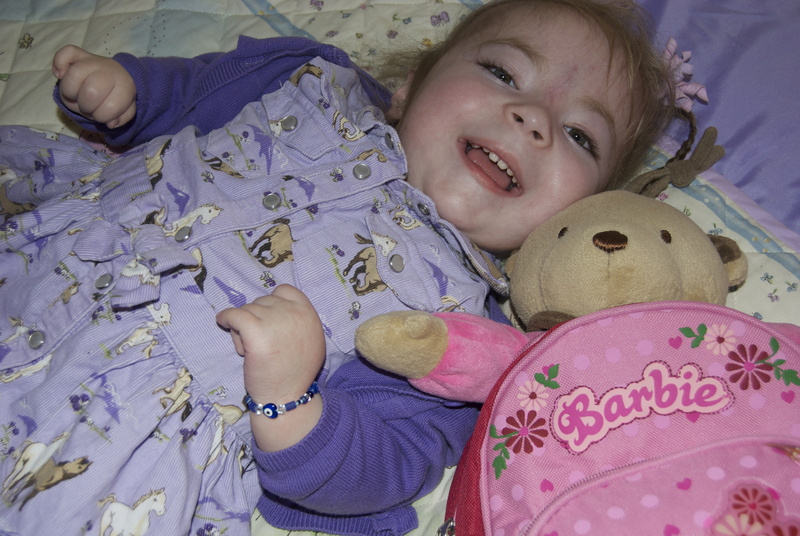 Now Pembe bear has been with Ladybug since she was first-born, it is always by her side during each and every hospital stay, and even has its own medical bracelet to match Ladybugs. Just in case you were wondering, Pembe is Pink in Turkish. It was one of the first words I picked up when I lived in Turkey, well that and Otur which means sit down. As a kindergarten teacher this came in very handy with a class full of 4/5 year olds. Back to Pembe Bear – PB has never missed a hospital stay or surgery and tomorrow Ladybug is scheduled for surgery. Her PEG G-Tube will be replaced with a “big girl” Mic-Key G-Tube, and if all goes well and they are able to find a good line Ladybugs Port-a-Cath will be removed completely. If they aren’t able to find a good line there is a chance a new port-a-cath will be put in its place. I’m obviously hoping for the first. I will be sure to post updates after the surgery. Good luck tomorrow Melissa and your little ladybug. Hoping and praying that the first option is the one that is successful tomorrow! Will be thinking of you guys!